Five months after unveiling its own in-store mobile payment service, Walmart has begun rolling out Walmart Pay in Texas and the retail giant’s home state of Arkansas. Available through the Walmart smartphone app for iOS and Android, Walmart Pay can be loaded with any major credit, debit or prepaid card or a Walmart gift card. Payment is made via QR code scan, with an e-receipt delivered to the app. The service now is available in the more than 480 Walmart locations in Texas and the more than 110 in Arkansas, the company announced. Walmart designed the service to work with almost any smartphone and accept any payment type, the company said—and Walmart’s ubiquitous retail presence could help the service compete against established in-store mobile payment platforms, such as Apple Pay, Android Pay and Samsung Pay—none of which currently is accepted at Walmart stores. Walmart’s app is used each month by more than 20 million customers and ranks in the top three retail apps in the Apple and Google app stores. 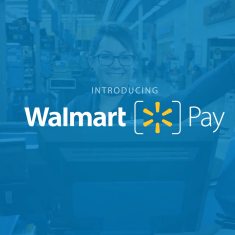 But some industry observers have speculated that the launch of Walmart Pay could be less about competing with existing m-payments services and more an effort to create a seamless omnichannel shopping experience for Walmart customers. “The service was built to make shopping easier and faster, something we know our customers want,” said Daniel Eckert, senior vice president, services, Walmart U.S.
Walmart remains a member of Merchant Customer Exchange (MCX), and last year joined MCX’s CurrentC mobile payments pilot in Columbus, Ohio. Video: Walmart Enters The Mobile Payment Game, But Is It Too Late?